The game of tennis or Jeu de Paume originated in France in the thirteenth century. It was played on an indoor court and became known as Real Tennis in Britain, Court Tennis in the United States, and Royal Tennis in Australia. No special clothes were worn by the nobility who played this game, although King Henry VIII, who was a keen player, preferred playing in a linen shirt and breeches. By the seventeenth century, a player is mentioned "cloathed all in white" (Cunnington and Mansfield, p. 86), the first reference to what was to become the standard color for the newer game of long, open, or lawn tennis, which was played outside. There was a lull in the popularity of the game in the eighteenth century, but by the 1860s, lawn tennis was firmly established as a favorite sporting activity, particularly in Britain. In 1877, the All England Croquet and Lawn Tennis Club (AECLTC), the ruling body for the Wimbledon Championships, established the first Championship match, a Gentleman's Singles Event. There were no formal dress codes. Instead, the AECLTC relied on the unwritten rules of middle-class decorum. Men traditionally wore white flannels with long-sleeved white cotton shirts. However, for women, the fashions of the time made it difficult to find a practical alternative to the restrictive clothes of the period. "Lawn tennis shoes, black with India rubber soles" (Cunnington and Mansfield, p. 88) were helpful, but long narrow skirts with trains, even those that could be tied back, hindered women from fully participating in the sport in an athletic way. By the beginning of the twentieth century, women were still playing in corsets with shirts buttoned to the neck and long ankle-length skirts. The arrival at Wimbledon in 1919 of Suzanne Lenglen from France changed forever the way women dressed on the tennis court. Lenglen wore a short-sleeved, calf-length, loose white cotton frock with white stockings and a floppy linen hat that she later replaced with her trademark bandeau. This style of dress, often made from white cotton pique but occasionally silk, influenced not just serious tennis players but was copied by young girls across the United Kingdom. However, as day-dress lengths grew longer in the 1930s, the divided skirt and then shorts became the norm for female players across the Western world taking the lead from American players. Men were also wearing shorts and short-sleeved shirts in the United States and France by the 1930s. Champion French player Rene Lacoste designed the first "polo" shirt in 1925 with his signature "crocodile" emblem chosen for his tenacity of play. Within a year, similar versions were available in London, made by Izod's of London's West End, who claimed they developed from golf shirts. British men were reluctant to wear shorts for competition tennis until after 1945. "Bunny" Austin was the only man to wear shorts on Wimbledon's Center Court in the 1930s. Although white was always the favored color, there were no regulations at Wimbledon about color until a 1948 restriction to discourage the increased use of colored trimmings on women's outfits. By 1963, the only items allowed to be not purely white at Wimbledon were a cardigan, pullover, or headwear. With the advent of sports manufacturers' sponsorship deals with top players, in 1995, Wimbledon restricted logos so that outfits were "almost entirely white" (Little, p. 305). Even away from Wimbledon, white remains the favored color. "Dainty garments trimmed with lace do not look quite appropriate for a strenuous game, and in these days when the game is played really hard, lady's undergarments often do not leave much to the imagination, therefore knickers made of silk stockingette seem to be quite the thing. (Woman's Life, 31 July 1924, p. 12) "
British player and former Wimbledon champion Fred Perry developed a leading line of men's sportswear from the 1950s, focusing on the traditional tailored shorts and short-sleeved shirts for men. New fabric technologies, in particular breathable fabrics, have slowly revolutionized sportswear in general. One of the oldest, Aertex, was developed in the late nineteenth century by two British doctors, mainly for underwear. From the 1920s, it was being used to make men's tennis shirts. By the 1960s, synthetic fibers such as quick-drying polyester were replacing cotton. In the 1970s, the fashion of long hair for men meant that many copied their idol Bjorn Borg's signature head-band, reminiscent of Suzanne Lenglen's bandeau. The 1980s was a decade of traditional styling for both men and women, with close-fitting short shorts being worn by men and wraparound skirts popular for female players. An exception was U.S. player Anne White who, in 1985, caused a sensation at Wimbledon by wearing a white catsuit. It was not a fashion that caught on. By the 1990s, men's tennis shorts became longer and looser, and shirts baggier. For women, however, the introduction of Lycra into tennis wear drew the focus away from their playing skills. Players with sponsorship deals, such as Serena Williams with sportswear firm Puma and Anna Kournikova with Adidas, promoted a body-clinging style light-years away from the corseted players of a hundred years before. Cunnington, Phillis, and Alan Mansfield. English Costume for Sports and Outdoor Recreation from the 16th to the 19th Centuries. London: Adam and Charles Black, 1969. Fascinating for the early period. Horwood, Catherine. "Dressing like a Champion: Women's Tennis Wear in Interwar England." 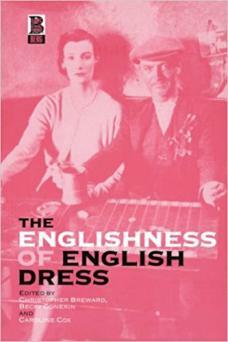 In The Englishness of English Dress. Edited by Christopher Breward, Becky Conekin, and Caroline Cox. Oxford: Berg, 2002. Concentrates on the period up to 1939. --. "'Anyone for Tennis? ': Male Modesty on the Tennis Courts of Interwar Britain." Costume 38 (2004): 101-106. Lee-Potter, Charlie. Sportswear in Vogue Since 1910. London: Thames and Hudson, Inc., 1984. Useful illustrations. Little, Alan. Wimbledon Compendium 1999. London: The All England Lawn Tennis and Croquet Club, 1999. Detailed listings. Schreier, Barbara A. "Sporting Wear." In Men and Women: Dressing the Part. Edited by Claudia Brush Kidwell and Valerie Steele. Washington, D.C.: Smithsonian Institution Press, 1989. Section on tennis, pp. 112-116.